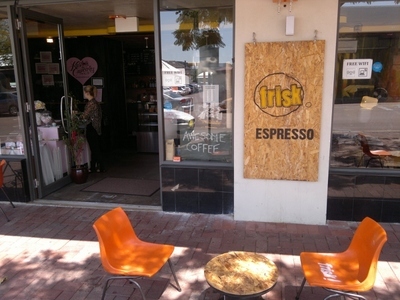 I was a coffee-joint drifter until I found my flavour at Frisk Espresso. Never quite content with what I found in my daily grind, my patronage would fade, with my palate not convinced it was getting the best. If I have a bad day, coffee is often the best part of it. You know what it's like. You want it to be good every time, no exceptions. I've got a lot of good things to say about Frisk. But mainly that it's fast, reliable, friendly and serves good coffee. The shop's décor is a bit of an eclectic mishmash and it works well. Anyone can find a comfortable spot amongst the retro couches; like the ones your grandparents used to have. There's plenty regular seating along the window-front as well as school-hall style chairs and cable drum tables on the wide footpath outside. The walls are adorned with a selection of purchasable artwork as well as an eye-catching graffiti mural. The rest of the shop is scattered with yesteryear trinkets and odds n' ends. Great for short attention spans like mine. Get stuck into the interesting collection of vintage National Geographic magazines and find out what your parents were reading about when you were born. Opened in the latter part of 2010, Frisk lies on the edge of the Northbridge nightclub cluster. The caffeine-fix-friendly opening hours make it a popular late night stop for the graveyard shift. During the day there is a stable stream of coffee aficionados but seemingly never enough to delay your order. Along with the fast and friendly service, this pick-me-up has never let me down. If you're looking to savour something sweet, Kustom Cupcakes share a section of the shop. It's very tempting. The latest development at Frisk is that they have recently secured a prized small bar licence. So expect a few small changes in the coming months as it evolves into Frisk Espresso & Small Bar. Still not convinced? They have compostable takeaway cups. That doesn't leave much to feel guilty about. How about free WIFI and a loyalty card? Say no more. 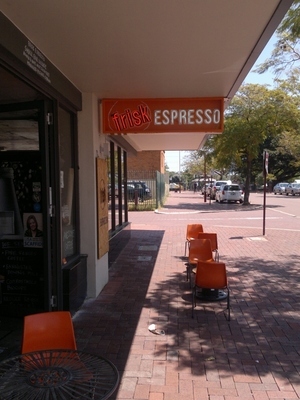 You'll find Frisk at 103 Francis Street, Northbridge and on Facebook. Cost: Small $3.80; Large $4.60; loyalty card with every tenth coffee free.